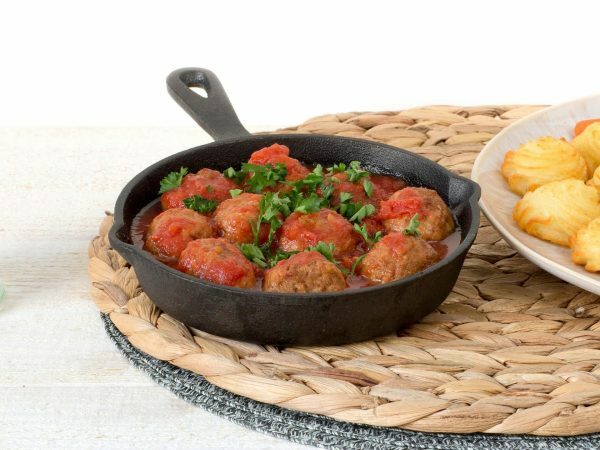 Spiced Balls with a solid bite, but entirely vegetarian. Excellent with a hot meal or as a snack with drinks. A vegetarian Snack ball weighs 17 grams. Water, 23% vegetable protein (soy, wheat gluten, pea), onion, palm oil, egg white*, potato, tomato paste, sunflower oil, modified starch, natural flavouring, salt, spices, milk protein (lactose), starch (wheat, corn), dextrose, colour (plain caramel), mineral (ferrous fumarate), vitamin B12. * free-range eggs. Produced in a facility that processes peanuts and nuts. Frying pan: 3 minutes on moderate heat. Stir every now and then. Oven: ± 5 minutes at 180°C. Turn once. Microwave: 1 min. on 900W. Barbecue or grill: Rub with (olive) oil. Grill 4 min.